and ask to be added to the Tree Farmer Alert email list. It's free! Colorado Tree Farmers are a network of land- owners that share forestry resources. If you would like to join our tours, question our experts, or share information on forest ecology and management with our members, click on the link above. Landowners who become certified Tree Farmers in 2014 will receive the Colorado Tree Farmers forest management manual, Saving Your Forest. A Useful Gift for a small donation! 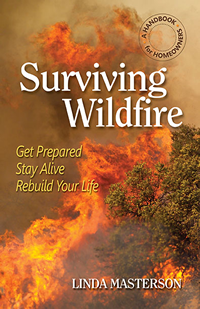 "Surviving Wildfire" is quickly becoming a bestseller with residents in the wildland-urban interface nation-wide. For a donation of $20 you will receive a comprehensive handbook on how to prepare and survive a wildfire from a Tree Farmer and resident of the WUI who learned the hard way. Watch a video interview with the author. "A very compelling read and extremely informative. The combination of the author's real-life experience and her diligent research makes this a very helpful handbook for people living with the risk of wildfire." "I will definitely recommend Surviving Wildfire to homeowners and insurance professionals; it is a great, comprehensive resource! Masterson explains everything in understandable, objective language that is anchored in her personal experience." The Colorado Tree Farm State Committee has a limited number of these books that they would like to give as practical gifts to residents of the wildland-urban interface willing to make a donation to continue our educational efforts. We're Colorado Tree Farmers, your neighbors just down the road behind the green and white sign. We are unpaid volunteers who believe that healthy forests are no accident. We inform private landowners of the value of actively managing their forests and encourage them to improve the health and sustainability of their trees for future generations. Please help us and, at the same time, help yourself and your family by donating now so you can receive your gift before the coming wildfire season.